18 April: LET’S CEE Film Festival brings VR cinema to Vienna – and the UN SDG Action Campaign is aboard as one of its programme supporters. Get faced with the human made threat of nature in the Arctic or in the rainforest; learn what it’s like to be homeless or to live in a refugee camp; make a trip back to your first year of life or to the old age – LET’S CEE Film Festival makes it possible. Under the motto “Let’s Open Your Mind”, the organisers are bringing virtual reality films from all over the world to Vienna for the first time. Thanks to the support of renowned partners such as United Nations, Greenpeace International, Stanford University’s Virtual Human Interaction Lab, USC Shoah Foundation, WIDE and The Guardian, a high-quality as well as visually strong offer of socio-politically engaged cinema will be shown. Sitting on a swivel chair with a VR headset and headphones, VR Cinema makes you, so to speak, the focal point and part of the film thanks to 360-degree images. LET’S CEE will set up two VR lounges: one at 4GAMECHANGERS, a festival for influencers and visionaries (18-20 April) and the second at Village Cinema Wien Mitte (21-22 April) with support of the presenting partner Cineplexx International. Admission is free, as is the whole short film programme at LET’S CEE. The hardly publicly funded Austrian festival, which tries to make a significant positive contribution to a modern and exemplary understanding of intercultural dialogue year by year, runs from 13 to 22 April in Vienna, Graz, Salzburg and Villach, the VR films can be seen from18 to 22 April in Vienna. Twelve-year-old Sidra walks us through her “home”, the Zaatari refugee camp in Jordan. It houses 130,000 Syrian war refugees, half of them children. Activist Sônia takes the spectators to the Amazon’s rainforest, where their Guajajara people are fighting desperately against the destruction of their habitat. Sea Prayer | UK 2017 | 7 min. | English | Khaled Hosseini / UN SDG Action Campaign On the second anniversary of the death of a three-year-old Syrian boy on the Greek coast, Khaled Hosseini wrote an imaginary letter of a Syrian father to his son. Arctic 360 | UK 2016 | 3 min. | English | Francesca Panetta, Nicole Jackson / The Guardian A virtual reality trip to the Arctic, which was filmed under environmentally-friendly conditions, shows the terrible consequences of human behavior. You can experience what it’s like to be homeless, protect yourself and try to save your home while living on the street. First Impressions | UK 2017 | 6 min. | English | Francesca Panetta, Nicole Jackson / The Guardian One experiences the first year of life from the viewpoint of a baby, interacting with the environment like a baby. A time span that none of us can remember. An exceptional VR experience: We find ourselves amidst the indigenous Munduruku in Amazonia who, due to a dam project, have to struggle for existence. Her father married her off when she was 13, but like many Indian girls, Ramadevi was then sold to a brothel. Now she fights against the sexual slave trade. A VR experience about the last phase of existence. You can immerse yourself in the lives of two old men preparing for their final days. In July 2016, Holocaust survivor Pinchas Gutter visits the Majdanek concentration camp. The Last Goodbye is a testimony of love, compassion and the human spirit. The partnership reflects a shared commitment to the idea that immersive technologies like virtual reality hold potential for experiential storytelling that spurs learning and action. MY World 360° invites young people worldwide to develop digital skills and create 360° media as a way to share their perspectives and advance positive action toward the UN’s Sustainable Development Goals (SDGs). MY World 360° ultimately aims to increase participation through a new expressive and immersive medium by young people and marginalized groups, and promote awareness and understanding of the Sustainable Development Goals (SDGs). Engaging young people through a powerful learning experience to help them build new digital skills for a purpose, the program is open to global submissions, with additional activity planned in Germany, India, and the United States. Oculus, Digital Promise Global, and the UN SDG Action Campaign also announced today that MY World 360° will launch national pilot programs in Germany and India. A limited number of German and Indian schools and youth organizations will receive 360° video production equipment from Oculus, as well as targeted support from local media mentors. In Germany, implementing partners for the national pilot include schools and youth organizations affiliated with the UNESCO Associated Schools Network and UNICEF. The implementing partner for the national pilot in India will be UNESCO’s Mahatma Gandhi Institute of Education for Peace. Since 2016, Oculus, the virtual reality company, has partnered with Digital Promise Global, a non-profit organization working to spur innovation in education, through the 360 Filmmakers Challenge. Bringing virtual reality production tools to classrooms and youth organizations across the United States, the program has engaged more than two thousand students and over 20 awarded youth-produced films. From 2012 through 2015, the UN SDG Action Campaign coordinated the MY World 2015, the UN Global survey that ensured 9.7 million people’s sustainable development priorities were included in the creation of the Sustainable Development Goals. The MY World 2030 project will continue to shine a light on people’s personal experiences around the world, ensuring they have a platform to have their say. MY World 360° will join a suite of storytelling projects which include the Humans of MY World, as well as immersive films promoted through UNVR. The MY World campaign, the success of UNVR, and the youth-produced media from the 360 Filmmakers Challenge caused Oculus, Digital Promise Global, and the UN SDG Action Campaign to develop the idea for a global campaign for youth-produced 360° media for SDG awareness and action. MY World 360° offers tools and resources to help participants learn about the SDGs, and to develop the skills needed to capture, edit, and share 360° media to represent their perspectives and their communities in an immersive and compelling way. Youth participants from around the world are eligible to contribute immersive media, including photography and film, to the open call for submissions to MY World 360°. Further details about tools, methods, and submission guidelines are available on the MY World 360° program page. The 2018 ECOSOC Youth Forum took place on 30 – 31 January 2018 at the UN HQ in New York City. The Youth Forum brought together hundreds of young leaders, ministers, civil society organisations and UN agencies to discuss the role of youth in building sustainable and resilient urban and rural communities. The Forum presented the UN SDG Action Campaign with the opportunity to bring the SDGs to the forefront of the discussions, to re-connect with some of our longstanding partners, as well as to inspire young leaders to #Act4SDGs and to foster new partnerships. A workshop was organized to inform and train twenty young change-makers from the UNDP Youth Leadership Program on SDG Action campaigning. Stories from the Humans of MY World Campaign (now in Nigeria!) were shared, MY World 2030 was introduced as both a data collection and advocacy tool, and a brainstorm took place about possible activities to be carried out during the Global Day of Action. Organized by UN Youth Delegates and hosted at the Permanent Mission of Germany to the United Nations, a discussion took place on how to better integrate the SDGs in our education systems. Rosario Gravito shared best practices from the Millennials Movement in Peru, while other campaigns and toolkits such as the World Largest Lesson (Project Everyone), MY World 2030 and MY Campus (UN SDG Action Campaign) were shared. During DPI’s youth event Virtual Reality Screening was used to transport viewers into real life crisis situations in both urban and rural areas. The concept has proven it’s impact, and also this time around youth leaders were both touched and inspired by the immersive storytelling portfolio of UNVR. Important: Youth Leaders, Civil Society organisations, and others, can still register for the Global Festival of Action on Sustainable Development taking place in Bonn on 21-23 March. Register here! From 28 September – 8 October, an abandoned ware house was transformed into a space for 35,000 visitors to learn about the latest the Sustainable Development Goals (SDGs) and the world-changing ideas that contribute to their achievement at the Expo for Design, Innovation & Technology in Toronto. The conference included 75 design projects, 125 speakers, 530 volunteers, 5500 student visitors, and 4 United Nations VR films produced by the UN SDG Action Campaign with a variety of partners. These films – Clouds Over Sidra, Waves of Grace, My Mother’s Wing, Nepal Earthquake Recovery — were integrated into Bruce Mau’s exhibition, Prosperity for All. Exemplary businesses, municipalities and research projects who are at the forefront of sustainability were celebrated last Friday as the winners of the 10th German Sustainability Award in Düsseldorf, Germany. SDG Advocate, Queen Mathilde of Belgium received this years’ honorary prize in the event, which also offered participants a multitude of experiences to connect with the sustainable development goals in the “SDG Hub”. The SDG Hub was created in partnership with the German service for development initiatives Engagement Global. On the first day of the prize, the Next Economy Award was presented to start-ups whose business models are oriented towards a green economy and overcoming social challenges. The winners were the producer of wooden T-shirts wijld, the telemedical care company DITG, the solution for basic optic care EinDollarBrille and Enerthing, the developer of a solar film that can replace disposable batteries. Some of the winning initiatives and nominees, such as the developer of ecological toilets Goldeimer, were at the SDG Hub to share which SDGs are of most importance to them – in their case, “Clean Water and Sanitation” took the podium. On the second day, the German Sustainability Award recognized top achievements in ecological and social commitment in different areas, celebrating stakeholders that are striving for the best sustainable solutions in line with the SDGs. Deutsche Telekom was awarded as Germany’s most sustainable large company, while Hanover won the prize for the most sustainable city. In the Award Ceremony, Queen Mathilde was honoured for her commitment to the SDGs and her contribution to improving the situation of disadvantaged young people since 2000 with the Queen Mathilde Fund. Her Majesty also supports several organizations such as UNICEF, WHO and Child Focus. “To achieve sustainable development, governments, businesses, civil society and individuals must work together: each of us has a role to play at their own level towards realizing this ambitious, but achievable goals. Even small-scale projects and individual acts can contribute to changing lives for the better”, said Her Majesty. She celebrated the fact that awareness of the need for sustainable development is growing in Belgium, Germany and all over the world. Yet, she reminded that there is no room for complacency, since there are areas in the planet where poverty is increasing and even affluent societies have not yet completely eradicated inequality. British primatologist and campaigner for environmental and wildlife conservation Jane Goodall, who was present at the SDG Hub, encouraged particularly young people to take action and not to lose hope. “We have to fight to live sustainably before it’s too late”, she affirmed. Annie Lennox, activist and singer of the famous hit of the 80’s “Sweet Dreams”, performed on stage, where she also delivered a message of hope. “My sweet dream is a better world for all”, she said. By diving in immersive storytelling provided by United Nations Virtual Reality, visitors of the SDG Hub could see life through the eyes of a refugee or learn what it is like to be a survivor of Ebola. Many expressed the feeling that virtual reality can play an important role in connecting people emotionally to each other and foster cooperation to implement the SDGs. Participants were also able to take the MY World 2030 survey, which allowed them to make their voices heard about which goals they consider more relevant for their lives and to explore their personal relationship with the SDGs. 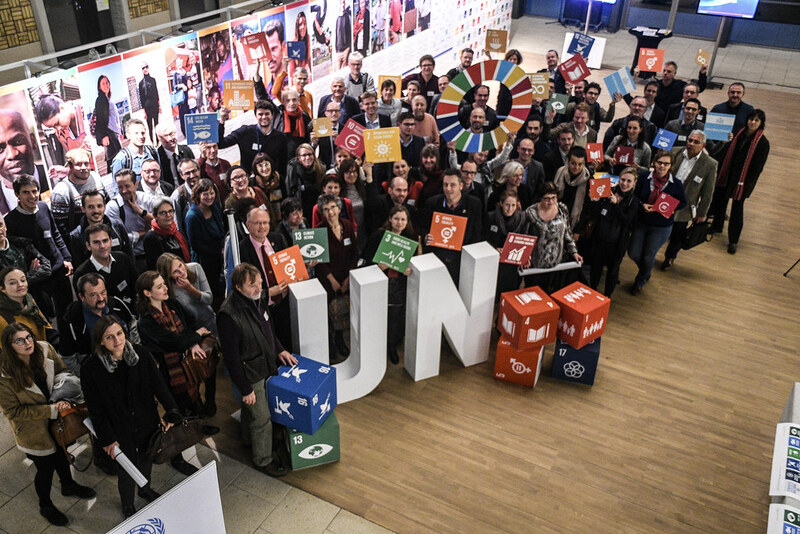 All in all, entrepreneurs, government representatives and individuals had the opportunity to experience how the SDGs provide a framework to all sustainable development efforts worldwide, including those celebrated in the German Sustainability Award. The SDGs were a key focus for global education actors when they gathered at the World Innovation Summit for Education (WISE) in Doha. Her Highness Sheikha Moza Bint Nasser, Chairperson of the Education Above All (EAA) Foundation and one of seventeen United Nations Secretary-General SDG Advocates, hosted and attended the Summit where world leaders called for urgent action to help young refugees and internally displaced youths. With more than 260 million children and young people out of school today, and only one per cent of young refugees able to access higher education, there were warnings that the SDGs will not be achieved if young people are denied quality education. The EAA Foundation signed several new partnerships at the event, part of its commitment to address the global education crisis and enroll 10 million out-of-school children. The SDGs were also visible at the UN SDG Action Campaign booth, located in the EAA Foundation exhibition space. Visitors could learn more about the Campaign’s work and could show their commitment to the SDGs by obtaining stickers and taking selfies with the goals. By taking the MY World 2030 survey, which polls top SDG priorities and citizen perceptions on implementation progress, they could consider the SDGs in relation to their own lives. Through the use of virtual reality, attendees of the Summit were also able to step into the shoes of children affected by emergencies, seeing first-hand the ways an interruption to education can stymie young people’s progress. The Campaign showed the 360’ films, Ground Beneath Her and Clouds Over Sidra, which showcase young girls affected by the earthquake in Nepal, and the Syrian Crisis respectively. “SDGs is about people, this is about leaving no one behind, about creating a world for our current generations, for our future generations.”It has to be about having a new vision, a new paradigm with implementation from all sectors. We want Europe to be leading from the front and Belgium is in a strong position to be a champion of change.” Barbara Pesce-Monteiro, United Nations Representative in Belgium urged to innovative thinking, stronger partnerships and more ambition in the implementation of the Sustainable Development Goals. “Combating inequality matters and our lifestyles matter to meeting the sustainable development goals. We need a whole of society approach and the center of gravity for political innovation lies within cities and people. We have an impressive set of initiatives run by associations in Belgium that provide civic platforms between people and the government.” Olivier De Schutter, former UN Special Rapporteur on the right to food, highlighted that we must all start changing the way we live. On 23 November, representatives from private sector, local governments, civil society organisations and students took part in a one-day inter-ministerial conference to tackle how Belgium can implement the Agenda 2030 and oversee a truly transformative multi-stakeholder approach. The UN SDG Action Campaign, along with the UN and UNDP in Brussels, organized an SDG Action Zone, occupying a central space to engage visitors on the Sustainable Development Goals, bring the voices of children, men a women from around the world and their needs to the center of the discussions. The UN SDG Action Campaign is excited to participate in the Media for Social Impact Summit, 14 September 2017 at the UNHQ in NY. Our Global Director, Mitchell Toomey will give a keynote address regarding Action for the SDGs, and Kristin Gutekunst, Executive Producer of the UNVR project, will moderate an exciting panel: Hear Ye! Hear Ye! Virtually Reporting the Realities of the SDGs. The Media For Social Impact Summit is an annual event that unites representatives of leading media companies, advertising firms and creative agencies with high-level United Nations representatives and communication experts to highlight the power of media to drive social change and strategize campaigns around pressing global issues. Organized by the United Nations Office for Partnerships & PVBLIC Foundation, the summit showcases innovative social campaigns and movements through keynotes, interviews, case studies and roundtables and provides a unique opportunity for delegates to network and learn from the brightest minds in media and build lasting partnerships that further social progress. 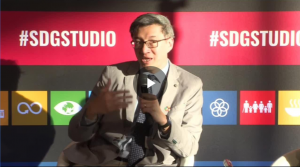 (3:30-3:40) How can the media support action on SDGs? VR, AR & MR are set to be mediums that effectively transform our world in the coming years. This panel will introduce VR as an impactful new tool for media. It will deep dive into the results of a successful UN integrative VR campaign and discuss how VR can democratize citizen journalism and access to training to spur activism for the SDGs through advocacy, education and training programs. Phoenix Eyre, Chief Executive Officer The Genesis Development Collaborative, Inc. High-Level events, interactive discussions, data showcases, the latest immersive experiences, UNVR screenings and specially thousands of people and over 500 organisations around the world mobilising action to #ACT4SDGs… we are looking back on a successful UN General Assembly and first Global mobilisation to celebrate the SDGs Anniversary. Hundreds of visitors came by the SDG Interactive Exhibition, curated by the UN SDG Action Campaign, to take part in a multitude of immersive experiences and participatory activations that support the UN system in communicating and advocating for the advancement of the SDGs. The experiences provided a voice to people around the world and a peek into how the SDGs manifest in their daily lives, giving delegates at the 72nd General Assembly the chance to understand their realities at this important annual political forum. Visitors experienced how today’s available and low cost technology can address tomorrows constraints on industry and life through today’s available, through the SIMTAINER. Light, a first-of-its-kind live-synced VR experience created by Mae allowed visitors to reveal the underlying fabric of our shared humanity and invite a posture of humility in the face of the radical collaboration required by all of us to accomplish the SDGs. Moving from empathy to action, visitors could also discover and share citizen perceptions on the SDGs with real time SDG data visualizations, sharing their views on SDG progress through the MY World 2030 survey, and the social media commitment capsules at the #Act4SDGs corner. On Monday 18 September, the Executive Office of the Secretary-General (UN Global Pulse) and the SDG Action Campaign convened governments, CEOs of major technology leading companies and innovators at the High-Level Event on SDG Innovation during the 72nd United Nations General Assembly. This unique event exposed governments to breakthrough ideas and innovations available, and leading tech innovators to the concrete problematics and challenges of countries in advancing the Agenda 2030. H.E. Miroslav Lajčák, President of the 72nd General Assembly opened the event. Among the group of participants were: H.E. Kersti Kaljulaid, President of Estonia and H.E. Dr. Thani Al Zeyoudi, Minister of Environment and Climate Change of United Arab Emirates, Reid Hoffman, Co-Founder of LinkedIn, Marc Benioff, Founder and CEO of Salesforce, Ashish Thakkar, Founder of Mara Group and Chair of the UN Foundation’s Global Entrepreneurs Council. The SDG Media Zone aims to engage people all over the world in the important conversations happening during this high-level week of the UN General Assembly and to strengthen the commitment of the international community in support of the 2030 Agenda. and Marina Gorbis, Executive Director, Institute for the Future. The ASEAN MY World survey was officially launched by the UNDP Administrator and all Foreign Ministers from the ASEAN region. The ASEAN MY World survey will increase public awareness and capture priorities and perceptions of progress on the agendas, interpret peoples’ aspirations towards the ASEAN Community Vision and the SDGs at the national and regional level, and subsequently help shape policy recommendations and plans of action for ASEAN Member States to achieve the agenda/vision in a timely manner. On 25 September, 2017 – the second anniversary of the ratification of the SDGs. The UN SDG Action Campaign, together with the World We Want 2030, local chapters of the Global Campaign Against Poverty (GCAP), and Action for Sustainable Development, joined forces to invite people around the world to take action and send a strong signal to leaders about the importance of the SDGs. REPOST: Our friends at the UNICEF Innovation Fund have released a call for proposals. Deadline is 17 September. Brief summary below, and full posting here: http://unicefstories.org/vr/. The Innovation Fund allows UNICEF to quickly assess, fund and grow open-source solutions that can improve children’s lives. Financial and technological support is available for companies that can show a strong founding team and a clear path to improving the lives of children. The UNICEF Innovation Fund is looking for start-ups that are developing and piloting new open source VR/AR solutions. We are looking to make investments in 1) software for authoring or consuming these new realities, 2) platforms and ways providing wider access to that software, 3) platforms and ways providing better tools for content creation (such as a template, workflow, or format), and 4) particular applications of content. Teaching people to perform simple tasks, in many languages, with higher retention rates and better motivational levels (examples: how to install a water pump; how to recognize malnutrition in under 5-year-olds; how to teach seamstresses to perform simple procedures). VR/AR also presents new ways of increasing access to experiential learning, including for people with disabilities. Accessing large amounts of data and deciphering them in a better way. Getting a simple picture from a complex collection of data points (examples: converting history of GIS data points from refugee camps into a VR environment for better planning; improving situational awareness for emergency responders). Undiscovered ways of using VR/AR to tell a story, especially by bridging cross-cultural gaps and creating a dialogue. Be daring: Applications to the Fund are accepted on a rolling basis. However, to be considered for the VR/AR-focused cohort, we ask you to submit your application by September 17, 11:59pm EDT.